The Edge, Tales of Suspense [#20, 2004] ed. 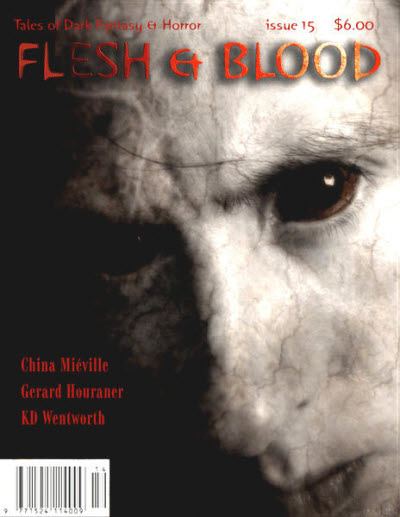 Greg F. Gifune (Thievin Kitty Publications; Marion, MA, $5.00, 52pp+, octavo, cover by Sandra DeLuca) last issue. 21 · Just Another Lovesong · Yorgos Dalman · ss; given as by Yargos Dalman in ToC. EOTU Ezine [v 5 #1, February 2004] ed. Larry Dennis (Clam City Publications, free, online, cover photo) North of Trapezium: The Science Fiction Issue III. EOTU Ezine [v 5 #2, April 2004] ed. Larry Dennis (Clam City Publications, free, online, cover by Ross Campbell) Kayleighs Day of Tranquility and Bliss. EOTU Ezine [v 5 #3, June 2004] ed. Larry Dennis (Clam City Publications, free, online, cover by Ai & Dax) The All Art Issue II. Fantastic Stories of the Imagination [No.25, Summer 2004] ed. Edward J. McFadden (DNA Publications; Radford, VA, $5.95, 52pp, quarto, cover by Tim White) An 8 page Wildside Press catalogue is bound in between pages 26 and 27. Given as Spring 2004 on ToC. 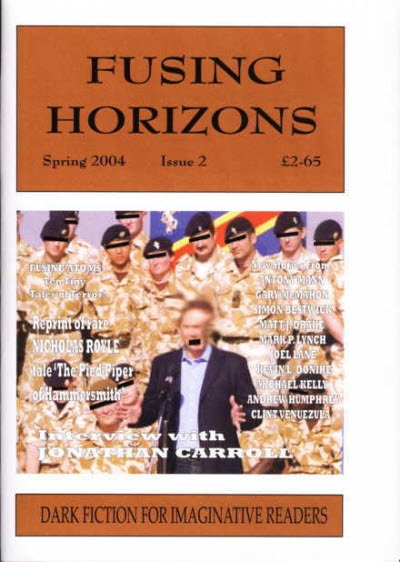 Fusing Horizons [Issue 2, Spring 2004] ed. Gary Fry (Gray Friar Press, £2.65, 95pp, A5) Small press fantasy/horror magazine, available from 19 Ruffield Side, Delph Hill, Wyke, West Yorkshire, BD12 8DP.